The Global Volcanism Program has no activity reports for Vsevidof. The Global Volcanism Program has no Weekly Reports available for Vsevidof. The Global Volcanism Program has no Bulletin Reports available for Vsevidof. The Global Volcanism Program has no synonyms or subfeatures listed for Vsevidof. 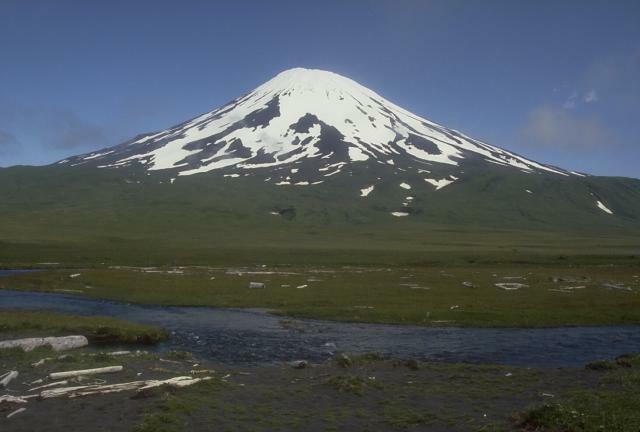 The symmetrical Vsevidof stratovolcano, near the SW end of Umnak Island, is one of the most prominent volcanoes in the Aleutians. Vsevidof contains a 1.2-km-wide, ice-filled summit crater that is breached by glaciers on the east and north sides. An E-W-trending zone of scoria cones that extends from 1220 m down much of the western flank has been the source of historical eruptions. The bulk of the 2149-m-high cone of Vsevidof was constructed during the Holocene. Young andesitic and dacitic lava flows were extruded from vents on the north and south flanks and on the west-flank rift. The largest lava flow traveled down the west flank to the coast, forming Cape Kigushimkada. 1878 Unknown Confirmed 2 Historical Observations West flank fissure ? There is no Deformation History data available for Vsevidof. There is no Emissions History data available for Vsevidof. 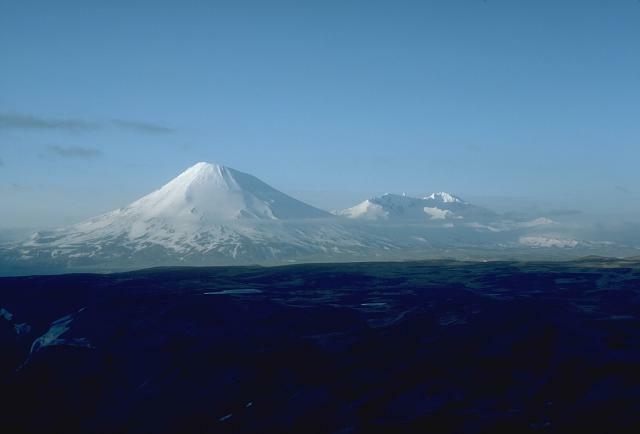 Mount Vsevidof is a symmetrical, 2149-m stratovolcano on SW Umnak Island. The historically active volcano, seen here from the south, contains an E-W zone of scoria cones on the west flank that fed many lava flows, including a large one that reached the west coast of the island and formed Cape Kigushimkada. A 1.2-km-wide summit crater is breached by glaciers on the north and east sides. There are no samples for Vsevidof in the Smithsonian's NMNH Department of Mineral Sciences Rock and Ore collection. Large Eruptions of Vsevidof Information about large Quaternary eruptions (VEI >= 4) is cataloged in the Large Magnitude Explosive Volcanic Eruptions (LaMEVE) database of the Volcano Global Risk Identification and Analysis Project (VOGRIPA).